At Pilates By Design, we will motivate you to discover the source of strength within yourself no matter your experience through an elevated fitness experience with a personal touch. We teach you how to take care of yourself, finding and improving the quality of your movement so you can live your life to the fullest. Through sitting and repetitive use our bodies, specificially our fascia, has lost the ability to transition, leading to stiffness and tension. Here in our studio we floss and work the tissue so you can be a better mover, ready to take on whatever life throws at you! Our knowledgeable and enthusiastic instructors keep your mind and body engaged while working out in a safe environment. All of our exercises can be modified to adapt to any body and our instructors can help you figure out what works for you to make the exercise more successful! All of our instructors are dedicated to making movement accessible for every client, no matter the circumstance. Originally developed by Joseph Pilates in the early 1900s, Pilates is a system of low impact exercises meant to strengthen muscles, increase flexibility and improve overall health. Designed to target the entire body, Pilates focuses on engaging the mind to move the body performing every motion with attention to breath, proper form and efficient movement patterns. 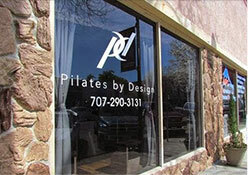 Appropriate for every body, Pilates strengthens the core, improves balance, increases coordination and decreases stress. Using BASI’s ten principles: precision, harmony, center, breath, balance, flow, awareness, concentration, control, and efficiency, as a foundation our classes are designed to develop muscle strength, coordination, flexibility and balance using resistance and assistance in innovative ways that help the body get to where it needs to be for optimal performance. The body is an instrument and Pilates addresses our bodies by starting with the core and working outward. Serving Solano County since 2011, we have a fully equipped studio to help meet our clients needs using a variety of apparatuses, including a wall mounted Barre. Every time you come through the door a new workout awaits you! Having the most knowledgeable and experienced instructors in the county means we can work with any level of client, including those that are pregnant or have just given birth and those with injuries or chronic conditions. In a world where more people are taking control of their health outside of the doctors office, let Pilates be your Insurance program fora healthy life! Whatever the reason may be, we motivate our clients to reach their fitness goals and access their inner strength, helping them move through life with renewed strength, ease and grace in a friendly environment where everyone is treated as family!